I found these cute bobby pin blanks at Hobby Lobby! I love Hobby Lobby!! 1. Prepare your clay according the package directions. You won't need very much. 2. 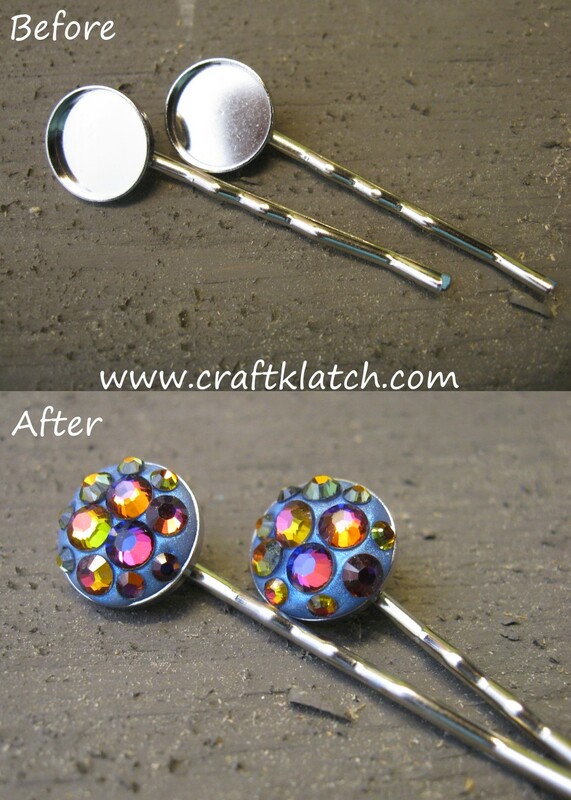 Put equal amounts into each bezel on the bobby pin and pat into place. 3. Attach the crystals by placing them into the clay and giving them a gentle squish. 4. When all your crystals are in place, take a soft brush and brush the powder all over the clay and crystals. 5. Allow it to cure for 12 to 24 hours and with a soft brush, brush off any excess pigment powder. That's it! Now go show off your pretty hair accessories. You don't have to worry about anyone having the same thing because they are one of a kind, handmade by YOU!! If you are having any trouble finding the Jewelry Clay, go to www.eti-usa.com and they have a listing of where you can find their products internationally! Thanks for stopping by and Happy Crafting!! What a fun idea! They turned out beautifully! Hey Everyone! I'm on Instagram! Blinged Out Bobby Pins Giveaway!